Each and every one of us sees our fair share of clients through the doors at Salon Enso. As many individuals as we see each day, month and year there is one individual that sees and remembers more faces than any other. It is Emily! Front Desk Coordinator Extraordinaire! Emily has been a part of the Salon Enso family for well over 3 (going on 4) years. In that time she has become a one woman dynamo. 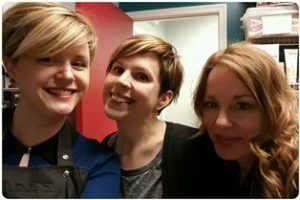 She is the individual that remembers each of our scheduling preferences (for all 8 stylists), can prattle off hair color terminology like a pro (having never enrolled in cosmetology school) and takes care of ordering all the Aveda products for the salon. She also trains the front desk staff, manages our social media accounts, edits my grammatical error ridden blogs (HIIIIIIIIIII EM!) and can tell you the very best places to visit in Costa Rica. 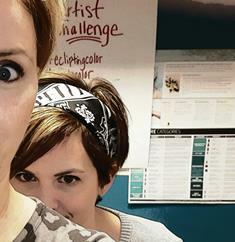 What you may not know about Emily is that outside the salon she is a momma to three great kids, digs metal music and is a pro at quoting 80’s films (we both heart the 80’s) and Golden Girls. And I’m not going to stop there – Emily is also one of the most artistic and crafty people I’ve ever met. While she may not be creating art on someone’s head, she works her aesthetic into the salon. Every month she researches and creates the most amazing artwork on the chalkboard above the couch in the waiting area. Every month she outdoes herself. 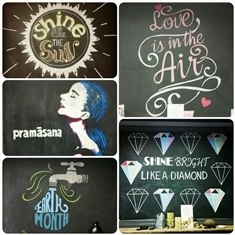 You must check out this month’s ode to Aveda’s Pramasana hair care line – it is incredible. Her artwork and creativity is also on display in her own house with an octopus adorning her bathroom wall, funky palm print upholstery on her staircase and concrete finishing on her countertops – all done by her hand. Emily is also famous within our staff for her handmade Christmas ornaments and her Pinterest perfect cheesecakes. 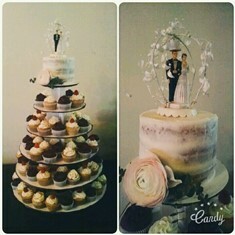 If you saw any snapshots from our owner Jen’s wedding, Emily baked and decorated the wedding cake, and the 120 or so filled and iced cupcakes that adorned the cupcake tower. She did multiple flavors and frostings which prompted a taste testing party at our table….spoiler – they were all absolutely delicious. So she can add ridiculously talented baker to her resume as well! I asked Emily what she enjoys so much about working at Salon Enso (in addition to treating us to cake) and she said she felt Enso is a very welcoming environment and working here is fun and relaxed. She’s also able to stretch and flex her creative muscles on a regular basis. I told her I think she enjoys working here because all of us are so rad (ha-ha). Whatever the reason, we here at Enso are incredibly fortunate to have Emily as part of our family. Previous Previous post: April Earth Month Events!